When Amber* (42 years old) presented to therapy, her goals were to increase her “assertiveness,” “confidence”, and “courage” while learning how to “slow down” and have more meaningful moments (“without feeling so rushed”). She had several goals for therapy, and a variety of situations in which she wanted to apply those goals—specifically, at work and in her relationships with others. Amber did not originally come to see me for longboard therapy. At first she came in for weekly sessions, and then gradually began attending on a bi-weekly basis. For months, Amber was able to make significant progress towards her initial goals. She worked hard and gained more confidence and courage throughout this time. However, there continued to be a recurring theme in our discussions: her ups and downs as a legal assistant working at a private firm. She consistently fluctuated between wanting to leave and wanting to stay at this particular firm. Finally, the day arrived when she decided she could not work in that “unhealthy” environment any longer. It was imperative for her to leave, so she resigned without having another job lined up. Amber continued coming to therapy, and one day decided to incorporate longboard sessions. Although she had never skated before, she felt that longboard therapy could help her with her transition into a new job. She wanted to challenge herself by learning how to skate, and she felt that incorporating longboarding into her therapy process would help her gain insights along the way to achieving her goals. Initially, Amber was nervous and very cautious. She worked her push stride one small step at a time. I assumed—as I have in the past with other longboard therapy clients—that it might take Amber quite a bit of time to learn how to skate, but I was wrong once again! After three outdoor sessions, Amber learned to skate pretty well. Additionally, she really soaked up the metaphor of longboard therapy. She found that it directly related to her positive frame of mind during her period of unemployment, as well as to her goals of increasing her assertiveness, confidence, and courage and learning to slow down. Amber clearly exceeded both of our expectations about how pivotal the longboard therapy sessions could be for her. Although she endured a difficult two months of unemployment, she consistently stayed positive and patient. 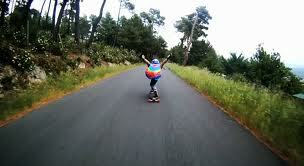 She attributes much of her patience during that transition to the process of learning how to longboard. Amber is now working at a new firm and dealing with situations that arise in a more assertive manner. She is forever grateful for her experience with longboard therapy, and I am forever grateful that she engaged in and embraced the process.